Viking Cruises today announced that its third ship, the Viking Sky, was officially christened during a public celebration in Tromsø, Norway. Located above the Arctic Circle on Norway’s northwest coast, Tromsø is a popular destination for viewing the northern lights – and a key port of call on Viking’s popular Into the Midnight Sun itinerary, which sails between Bergen and London, allowing guests to explor the northern-most reaches of Scandinavia. Viking’s ocean ships are classified as “small ships” by Cruise Critic, and the 930-guest, 47,800-ton Viking Sky navigated into the Tromsø harbour this morning, where she received a warm welcome with co-ordinated water cannons from Norwegian redningsskøyten boats, music from local bands and flag-waving Tromsø residents. After arriving today in Tromsø, Viking Sky was positioned in the harbour adjacent to a concert stage constructed specifically for the celebration. Viking guests and residents of Tromsøwere treated to a public concert, with performances from a variety of Norwegian musicians – including Arctic Philharmonic, Lisa Stokke, Violet Road, Sara Marielle Gaup Beaska and Jørn Hoel. During Viking Sky’s christening ceremony, Marit Barstad, sister of Viking Chairman Torstein Hagen, served as ceremonial godmother and offered a blessing of good fortune and safe sailing forViking Sky – a naval tradition that dates back thousands of years. Several elements of the christening ceremony paid homage to the Norwegian heritage of both the company and godmother. Instead of champagne for the traditional bottle-breaking,Viking Sky was christened with a bottle of Gammel Opland aquavit, which hails from the same county in Norway where Torstein and Marit’s mother, Ragnhild – also lovingly known as “Mamsen” – was born. “Mamsen’s,” the Norwegian deli onboard Viking Sky, was also named after Ragnhild, and Gammel Opland was her favorite brand of aquavit. Additionally, in honour of the original Viking explorers, a gilded Viking axe was used to cut the cord for the aquavit christening. The particular axe used is a replica of a gilded Viking axe artifact discovered near Tromsø. Also, the chopping block used for the ceremony was brought from the Rotnes Farm in Nittedal, where the godmother grew up. 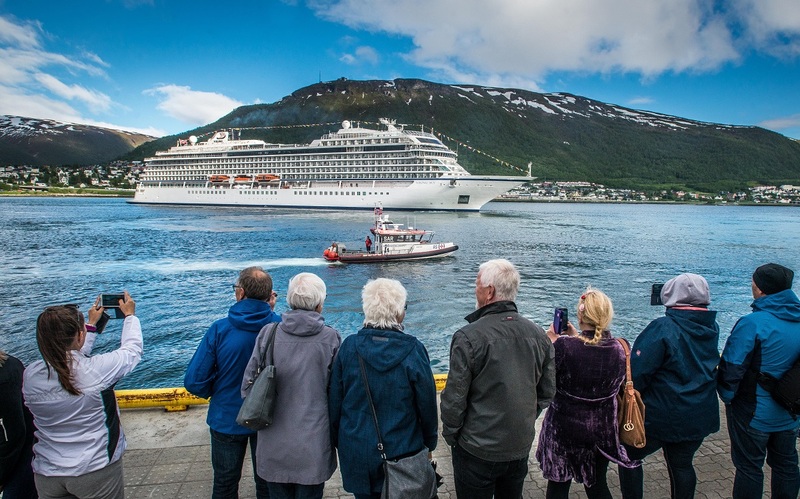 Immediately following the christening, Viking Sky set sail fromTromsø with a convoy of small boats and fishing vessels to spend the longest day of the year in Nordkapp (North Cape). Onboard the ship, guests were also treated to a special christening dinner with Norwegian delicacies and musical performances by Lisa Stokke, Tor Jaran Apold and Mari Boine. The ship will now spend the summer season sailing Viking’s popular itineraries in Scandinavia and the Baltic. LivNordic Spa: In keeping with Viking’s Nordic heritage, The Spa onboard is designed with the holistic wellness philosophy of Scandinavia in mind—from the centuries-old tradition of the sauna to a Snow Grotto where snowflakes gently descend from the ceiling through chilled air. In addition, Viking Inclusive Value provides a small ship experience at a big ship value with every cruise fare including a veranda stateroom, shore excursions in each port of call, all onboard meals, and all port charges and government taxes. Guests also enjoy many complimentary amenities as part of their fare, including: beer and wine with lunch and dinner service; premium dining reservations; Wi-Fi; self-service laundry; access to the Thermal Suite in the LivNordic Spa; and 24-hour room service.